Online backup should be dealt with respect and the proper attention, due to the fact that there is a lot at stake for somebody who jeopardizes personal or business files. Even if we go ahead with creating local backups, there is nothing that guarantees us that the devices we have stored our data in will always function perfectly. This is where online backup services emerge and fill in the gap that has occurred. Carbonite was founded in 2005 in Boston and it includes data centers at multiple locations in the United States. With our Carbonite review, we have approached this service and we have evaluated what these professionals have been offering to customers. If you are eager to find out what we have come up with, read along! Carbonite has been offering online backup services for ten years and its reputation has been growing significantly over time. This is what has urged us to move forward with our Carbonite backup review and see what lies beneath the name and the reputation. Time to initiate our review, by taking a deeper look at some of its basic features, wouldn’t you agree? 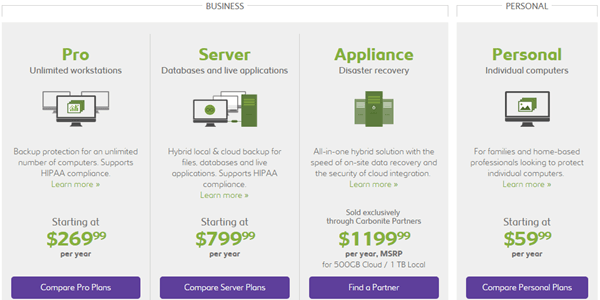 There is no limitation as to the data that Carbonite will allow you to backup online. 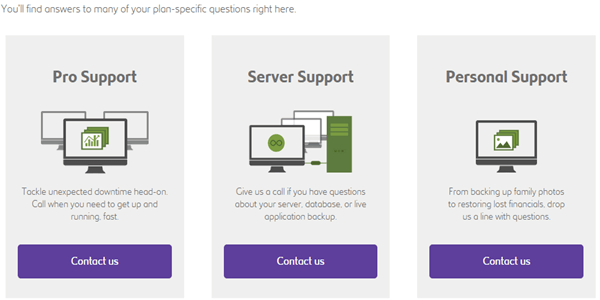 After having subscribed to a specific plan, you will have the opportunity to back up all the files you want and the Carbonite online backup setup is a piece of cake. One thing to keep an eye on is that large files typically exceeding 4GB will require your manual backup command, rather than get automatically stored online. This can be confusing to some and hold the fear of forgetting something. Older versions or deleted files will remain stored for 30 days. Files are encrypted and this adds to your overall security layering. Syncing, sharing and accessing files can be achieved through the use of simple and effective apps. Of course, there are plans offering extra features like external hard-drive backup, mirror image backup, automatic video backup and courier recovery service. However, the cost varies accordingly and so it is up to you to place your priorities. There are personal and business plans, as far as pricing is concerned in Carbonite. The basic personal plan covers an individual PC and costs $59.99 per year. You can save up to 10%, in case you go for longer contracts that stretch up to 3 years, which is perfectly understandable. The plus plan starts at $99.99 and the prime plan goes up to $149.99 for the same duration, lasting a whole year. Whatever you decide to go for, there is a free trial of two weeks for you to make sure that the service suits your needs. When it comes to payment options accepted, Carbonite is quite generous and accepts all credit and debit cards, as well as PayPal. In the field of help and support, Carbonite computer backup provides a lot of different alternatives. There is a FAQ section with many details that will enlighten you as to the services offered by the company, along with blogs that can help you out a great deal. Apart from these options, you get the chance to access the contact form of Carbonite for different plans. Based on the plan that you have subscribed to, you will access a specific contact form and facilitate your experience. Last but not least, there is phone support that you can use. The only drawback when referring to Carbonite help and support is the fact that there can be significant delay while waiting for somebody to take care of your issues or contact you. Moving forward with our Carbonite review, we cannot help but highlight the substantial compatibility that allows you to backup files on most OS and devices. With the exception of Linux, Windows Phone and Kindlefire, everything else is perfectly compatible with the services provided by Carbonite. Whether you wish to run it on Windows or Mac, Blackberry or iPhones and Androids, Carbonite will have no problem whatsoever. Instead, you will get the opportunity to start right away and possibly download apps that make your experience even more pleasant. Overall, Carbonite online backup is a solid solution for all those people who wish to shield their data online. With affordable price rates and with the complimentary fortnight as a free trial, you can get premium backup plans and rest assured that you are always on the safe side. Even though there can be some minor issues with the delays in their support system and although large files need to be backed up manually, the easy setup and usage of Carbonite online backup system makes it really helpful and versatile. Carbonite is a trustworthy online backup service provider, offering unlimited storage data and a generous free trial without any commitments whatsoever. It comes at an affordable price and it is easy to setup and use. On the other hand, the deleted files are only stored for a month and not infinitely. There are some duration issues with the support and you always need to keep in mind that certain large files are only backed up manually. Carbonite is a waste of money. In three years it has not recovered one file. I kept thinking it was my fault. Not so. This does not perform as promised. I have even lost all of my pictures. We’re sorry that Carbonite did quite work out for you. We hope that they read your comment and improve their service. I have not had a problem with restoring individual files. However I opted for the Personal-Plus which provides the ability to do a full HDD Image backup and periodic snapshots to refresh my disk image for fast restore. I am in the midst of a pending HDD Failure, and found that the backup image has lost all restore points, even though the periodic snapshots appeared to be working over the past year. The customer support techs said they were at a lost since the dedicated BKUP drive was “being updated”. They assured me when time came to to do the system recovery the backups would be visible. As a Software Engineer with 40 years experience in telecom/aerospace/financial services, this sounded like a put off! I was right! The Recovery process puts up a barely readable screen which confirmed my fear that the external HDD had NO restore points! $100/year for a false sense of security. In general the entire UI for this app needs a professional overhaul. The basic service is OK but be aware that you will need to specify some files for backup as it seems certain types(exe, media) of files are excluded from backup unless specifically selected. The Mirror Image Restore capability is a waste of money if you can’t rely on it to get you back in business when you need it.